Versatile Geelong is suitable for the cosmopolitan person who likes living in the inner city, as well as for those who enjoy better the tranquillity and views of the coastal or rural areas. Are you the Cosmopolitan-type? 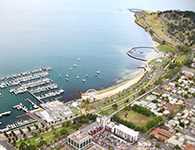 Then you should head to Pakington Street, Geelong West, full of nice coffee shops, bars and boutiques, or the CBD, offering many different gastronomic experiences such as the growing Little Malop or the relaxing Waterfront, where you won’t only have delicious food, you will be eating with a view! For those of you who couldn’t fit everything in your suitcase or who want to follow the new fashion trends, there are many shopping centres. Westfield and Market Square are the two main shopping locations in the inner city. There are more shopping centres in other suburbs as well as boutique shopping strips. If you prefer a coastal outlook, then head to The Bellarine. The Bellarine has a dream position with a mix of gentle estuary, rocky coastal headland and ocean beaches surrounded by food, wine and attractions. There are good places to eat and plenty of boutiques to shop up a storm. Big crowds are not your thing? Perhpas you prefer the country lifestyle? The granite peaks of the You Yangs , near Lara, dominate the skyline of Geelong and the region. For generations, families have enjoyed nature walks and views from the summit. The rural towns of Wallington and Drysdale are surrounded by rolling green hills that are dotted with farms, dairies and vineyards. Did you know that many people who work in Melbourne live in Geelong? The reason is the affordable prices when renting a house and a more relaxed living style with less congestion.